PRICES OF LIVE LAMBS, WERE ABOUT THE SAME AS A YEAR EARLIER. will be much smaller this spring than last. weather has been favorable for shed lambing and feed has been abundant and cheap. proportion of early lambs will be marketed after July. and choice slaughter lambs of $8.95 was slightly higher than a month earlier. Slaughter ef sheep and lambs in February continued smaller than a year earlier. Nebraska was somewhat smaller than a year earlier. irgs cf lambs in the grass lamb marketing season, from May thrug. lambs durin- March, Anril and May. EARLY FPIB- LAMB CROP OF l-m'? is materially improved, many of the early California lambs will be sold as feeders. feeder lambs to midwest feed lots. The number of early lambs in Arizona is about the same this year as last. are expected to improve rapidly, since prospects for scoring feed are favorable. become favorable, ,the movement of yearlings in June and July may be large. ducing States than in California and Texas. In the Southea.rtern States, winter. and lambs are in good condition and prospects for spring pastures are favorable. will be a little larger this year than last. different from that of last year and ewes and lambs are in good condition. more than 3 million hiad smaller than the hiFrh level of 1931.
million head, which wa.s =-.3D,000 head larger than on January 1 last year. reported at the be.in .inAn of 1736.
from Texas in April and. M'-y compared with those of last ye:'r. lings from Texas in June and July will be relatively large. in 1931 and only slightly smaller than the peak number reached in early 1934.
crease in the native States had occurred since 1931.
numbers for the country as a whole may be moderately upward in the next few years. in the past 2 months. grease basis, lower than the current spot pl-ices of similar wools. exceeded that of a year earlier. 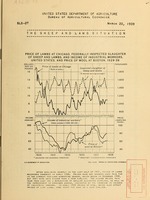 Agricultural Economics, WTs'-ington, D. C.
:Dpi. :Jan. :Feb. :Dee. :Jan. :Feb. :Dec. :Jan. :Feb.
:Dcl. Dol. Dol. D0., Dol. Dol. Dol. Dol. Dol. 1937, and all weights in 1938 and 1939. Feb. :Feb. Jan : Feb.
1/' Eureau of Animal Industry. 2/ Chicago, Kansas City, Omaha, Denver, St. Joseph, Sioux City, and St. Paul.